Nick was checking his phone as we waited for a presentation to begin. On his phone’s background was a picture of a dog. I asked Nick about it. It was his dog that had recently passed away. He said he was the best dog ever. 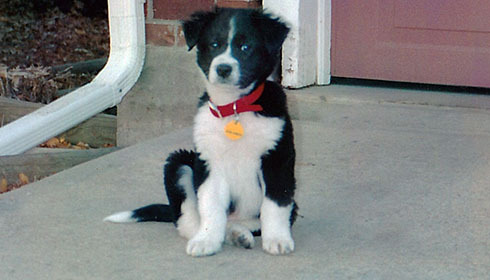 Nick’s dog had some border collie in him and it made me think of Strider, my old dog. 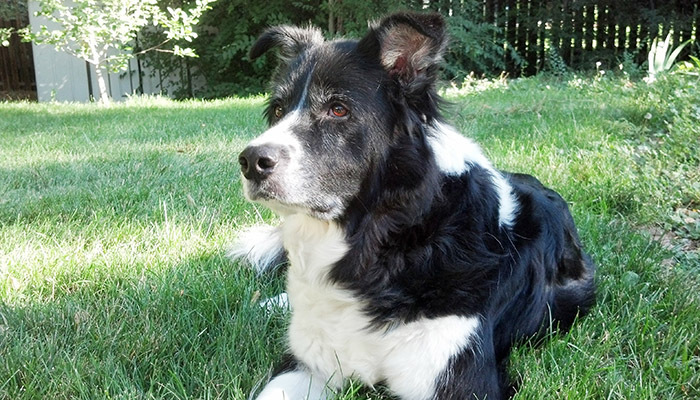 Strider just turned 14 and is moving slowly and his muzzle gets grayer every day. We got him in 2003 the day before last Lord of the Rings movie came out, so we named him after one of the characters. I insisted on a male dog because I was surrounded by females – my wife, two daughters, and two female guinea pigs. I needed a male around the house to help with the balance of power. I call him my son. He’s a mix of border collie and mutt. He has the look and personality of a border collie but is about 65 pounds, whereas a normal size for the breed is 35-45 pounds. I always say he’s a border collie on steroids. Strider hasn’t always been great. In his first year, he ran away a lot. He certainly was a cute puppy but was creating more stress than he was adding to the energy in the house. If he got out of the house or backyards he would run down the street and it would annoy the neighbors because it would rile up their dogs. And he would chew up shoes and other things we preferred to keep intact. But we persevered and kept going through training with our neighbor Laura. She was always very patient with him and saw his potential. If we’d given up on him we wouldn’t have had the many years laughs and companionship. He didn’t show up at our doorstep a mature dog. He had to be trained with patience and attention. The same can be said about giving up on children, marriages, employees, and friends. It takes patience, understanding, time, and effort to make these things work. A few years ago I noticed that when I said something like this, Strider would creep away to the basement. I never took my frustration out on him but he was sensitive to when I was angry. I learned from Strider that it’s okay (and wise) to move away from uncomfortable situations. You need to listen to your gut and move away from unhealthy people or environments. Strider has a cute habit of coming into our room when we are in bed. 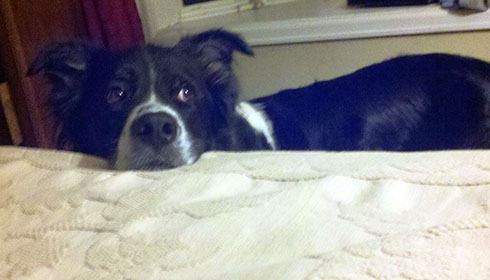 He puts in his head on the bed and looks up at us with his big brown eyes. How can you resist this? It’s hard, but he takes up a lot of the bed and sheds a ton. The good thing is he doesn’t jump on the bed without permission. When we relent it normally takes just a pat on the bed to signal he’s allowed up on the bed. This normally comes during the winter when the room is chillier. I learned that you need to ask for what you want. You can’t assume people can read your mind. Ask for what you want, whether a date, a raise or to go for a walk. People can’t read your mind. I’ll pull out my iPod and headphones when I go to work out and Strider gets excited. He knows this is normally a cue that it’s time for a walk. He gives me a forlorn look when I head out the door without him. I even surreptitiously grab them so I don’t disappoint him. I’ve learned that you should keep your eyes open for good things. There are cues that someone could be fun to hang out with or an event that could be beneficial to your career. Strider can be annoying when people come to the door. They can barely enter our house without him sniffing and howling. He’s excited to see different people who he’s seen a lot and give him attention, like my sister-in-law or my friend Mark. I’ve learned it’s good to be enthusiastic about people. People should be celebrated when they come into your house. Or when you see them on the street or at church. It means giving a hug, paying attention to them (not your phone), and being excited to see them. My buddy Glenn and I arranged a hike a couple years ago at a state park. I was hesitant to bring Strider because of his age. I didn’t want him to be a hindrance on the hike. But I decided to take him with us because he loves his time in the mountains. We started at an elevation of 8,100 feet and hiked four miles up to 9,400 and then back down. I’d get to a point where I thought we were close to the end and then it was another two miles. By the end of the hike, Strider and I were both struggling but we kept going. I learned you have to keep pushing forward. Yes, it’s okay to rest, but you’ll have something to be proud of if you don’t stop. One of the Strider’s most endearing quirks is sitting in the backyard grass looking outwards like he’s guarding some sheep. He’s on the lookout for danger or an errant squirrel. We were recently camping, and we both got up around sunrise. I made a fire and was reading. All the sudden Strider perked up. He was staring at something. I looked where he looked and there was a deer 30 yards away munching on some grass along the road. I grabbed his collar because he’ wanted to run after deer in his younger days (a big no-no in Colorado). But he kept staring and then would stare at a rabbit he saw nearby. He kept shifting his sights from the deer to the rabbit then back to the deer. We need to be vigilant for opportunities to advance our career or to help a person in need. Keep your ears and eyes open. I work from home and Strider will come down to my office in the basement to visit me a couple times a day. He wants some attention or needs to go outside. The problem is that he has a hard time getting back up the stairs. One reason is the wood floors on our main floor. His hips are gimpy, and he slips on the wood floor. So, we got some cheap carpet runners for him to transition from the stairs and also to go from the living room to the back door. What about someone in your office that’s weaker? They may have potential – smart, enthusiastic, and fun to be around, but is having a hard time doing their job. Maybe it means getting them a mentor or sending them to get additional training. That person could be an all-star with some help. There are obviously exceptions to each of these lessons, but overall, they are good principles to live by. Take a moment to choose one or two of them to start implementing in your life this week. Strider is a great dog. He’s provided comfort, companionship, and entertainment, along with many life lessons I can take with me. This made me smile Dave. I have a 15-year old standard poodle named Corduroy. Your insights speak such kindness and grace in an otherwise unforgiving world.